We got our Valentine wish…a night with Jack Walker. 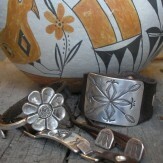 After a long dry spell, we’ll be flush with ingot silver and leather from this ever-popular artist. Bring your love, tag your favorite Walker piece, and enter to win our Whiskey and Wine package to start your Valentine’s Day celebration right. Our Menu from the White Buffalo Club includes Wagyu beef sliders, Salmon crudites, and bacon-wrapped dates – accompanied by Wyoming Whiskey, wine, and our own Huckleberry Champagne cocktail. Non-Alchoholic beverages are ALWAYS available.